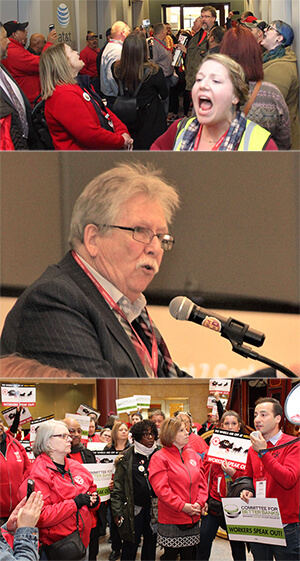 CWA District 7 Conference attendees rallied with AT&T Legacy T workers (top) in CWA Locals 7200 and 7250, calling on the company to bargain a fair contract. Attendees also joined Committee for Better Banks members in occupying the Wells Fargo office (bottom) to demand a voice for workers on the job. Shelton commended eight D7 Locals, 7019, 7050, 7110, 7304, 7401, 7603, 7800, and 27056, for boosting membership since the beginning of the year despite the organizing challenges union members are facing across the district, and urged members to focus their efforts on organizing new members at AT&T Mobility and CenturyLink/Level 3. "Internal organizing—expanding the union in our workplaces—is only the first step on the way to making our whole country union again," Shelton said. "Just like we're going to organize all of CenturyLink, including Level 3, we are on a path to make the whole wireless industry union!" CWA Secretary-Treasurer Sara Steffens, CWA District 7 Vice President Brenda Roberts, Telecommunications & Technologies Vice President Lisa Bolton, NewsGuild-CWA President Bernie Lunzer, U.S. Senator Amy Klobuchar, and Minnesota Governor Tim Walz also attended the conference. Conference attendees participated in two rallies in Minneapolis. Attendees showed their support for AT&T Legacy T workers in CWA Locals 7200 and 7250, who have been working without a contract for nearly a year, calling on the company to bargain a fair contract. Attendees also joined frontline bank workers and Committee for Better Banks members in occupying the Wells Fargo office to demand a voice on the job and to tell the company that the only way to reform the bank is for workers to have a seat at the table. Workers delivered a petition with 16,000 signatures urging Wells Fargo leadership to meet with workers to talk about low pay, unfair metrics, and offshoring.